Hello, Lisa Hoel here. IT'S COMING!!! You know what I'm talking about, Pumpkin Spice Season!! Ha ha! Fortunately I like pumpkin spiced things so I'm okay with it. Plus it gets eclipsed by Peppermint Season as soon as Dec. 1st rolls around so it's only a few months. I made a celebratory card using the new Perfect Pumpkin Die Set and the Leaves & Petals Die Set. 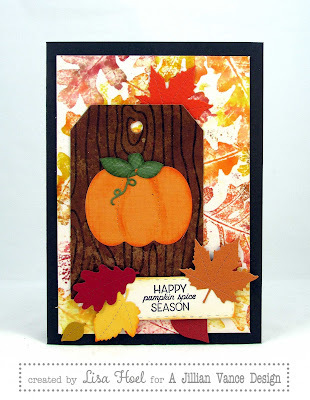 Love your fall inspired card! Fabulous Fall card, Lisa. Love how you created that background together with the wood grain, pumpkin and leaves.